Order Ritchies Crown Caps Red 40's from the Stirling Homebrew Shop UK. Buy Ritchies Crown Caps Red - 40 caps and other Homebrew Accessories safely online in the UK. 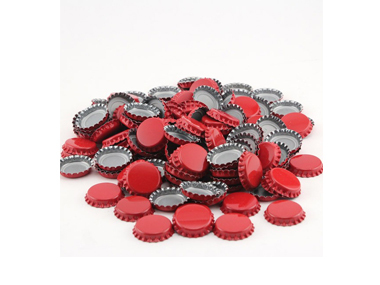 Use these red crown caps for sealing beer bottles. Fits all normal size beer bottles. Use these red crown caps for sealing beer bottles. Fits all normal sized beer bottles. Where to buy Ritchies Crown Caps Red 40's safely online? Shop at the Stirling Homebrew Shop if you are wondering where you can buy Ritchies Crown Caps Red - 40 caps safely online in the United Kingdom. Crown Caps Red 40's - Ritchies Crown Caps Red - 40 caps in Homebrew Accessories and Homebrew.